What We Eat Is Laughable: Dip-licious! My friend Tim's birthday was last week and he celebrated by way of a cook out. I definitely wanted to bring something to share with the crowd, but what. Tim's wife, Becky, is vegan so i wanted to make sure what I brought appealed to all in attendance both in taste and content. 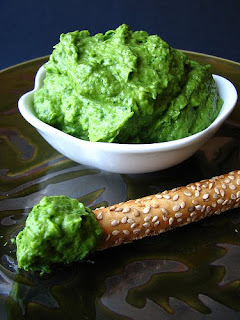 I remembered some drunken conversations I'd had with Tim in the bast regarding a mutual love of Indian food and it hit me: spinach avocado dip with Indian spices! I love this recipe. It's so simple and easy and it turns out great every time. I originally had this at Justin and Lisa's Indian thanksgiving a few years ago when Kyle's then girlfriend, and current wife, brought it to share. I loved it instantly. I hunted down the recipe and first made it for a vegan thanksgiving feast I attended about two weeks later. Combine all ingredients in a food processor and process until smooth. And not only is it simple and ridiculously delicious, but it looks amazing too, like a leftover Double Dare substance, making it great for holiday parties, especially Halloween! Lemon juice is fine, but I prefer lime for flavor. An acid is needed to keep the avocado from oxidizing and turning brown. A few dashes of hot sauce will kick this into authentic Indian territory, I use a sauce made from Scotch Bonnet peppers that adds a ton of heat but doesn't skew the flavor. This would also make an interesting pesto if one were to sub olive oil and some sort of nut--traditionally pine nuts--for the avocado!